Speaking at a public meeting in Vidisha, Modi said, “Two days ago they dragged my mother’s name during a rally and today I read in social media that they had dragged my father’s name who died 30 years ago and had nothing to do with politics, and ‘Namdaar’ (Gandhi) is defending them. Prime Minister Narendra Modi in a sharp attack on Congress president Rahul Gandhi accused him of defending those who were abusing his parents, and argued that Congress was doing so because they had run out of issues and did not want to take on the BJP on a debate over development. Modi was referring to Congress leader Vilasrao Muttemwar’s comment during an election meeting in Rajasthan that while the world knows who Rahul Gandhi’s parents were, no one knew who Modi’s father was. 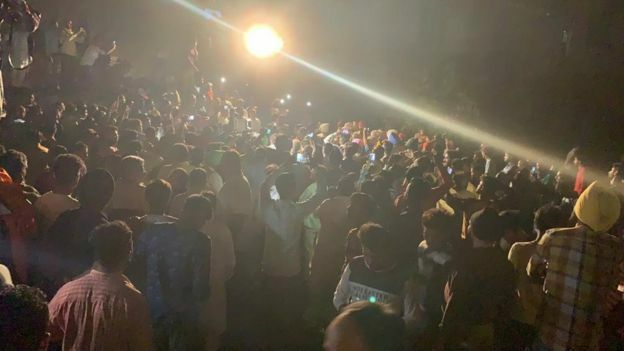 In Alwar, the PM described the Congress as the party’s ‘jatiwadi mansikta’ (caste mentality) while referring to Congress leader CP Joshi reportedly questioning the PM’s caste at an election rally in Nathdwara on Friday. “Someone abuses my mother, someone questions my caste,” he said, while quoting both Kabir and seer Ravidas to drive home the point that humans were one despite their caste. The PM also said that the Congress gives more importance to its leaders than Mother India, in reference to a video of Congress leader BD Kalla where he is seen stopping a man shouting ‘Bharat Mata ki Jai’ and telling him to say ‘Sonia Gandhi ki jai’. In both Rajasthan and Madhya Pradesh, Modi reiterated that the Congress was resorting to “jatiwaad ka zeher (the poison of caste)” and claimed the moral of the rival party was down whereas that of BJP was up. He also said four members of one family got Bharat Ratna but Ambedkar did not get the country’s highest civilian award and the Congress ensured his defeat in elections. Reacting to Modi’s speech, Congress’ Odisha in-charge Jitendra Singh alleged that the Prime Minister was spreading lies in the name development in Rajasthan and elsewhere. “In Modi’s speech there were many words such as ego, development, casteism, dalit, religion, dynastic, small mentality, martyrdom of jawans, one rank-one pension, welfare of farmers, development by the Vasundhara Raje government and so on. They were just lies told to cheat people,” he said. 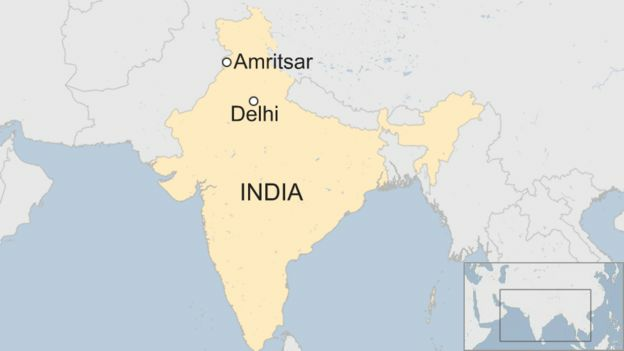 More than 50 people have been killed and 200 hurt after a train ran into a crowd near Amritsar in India’s northern Punjab state, police told the BBC. 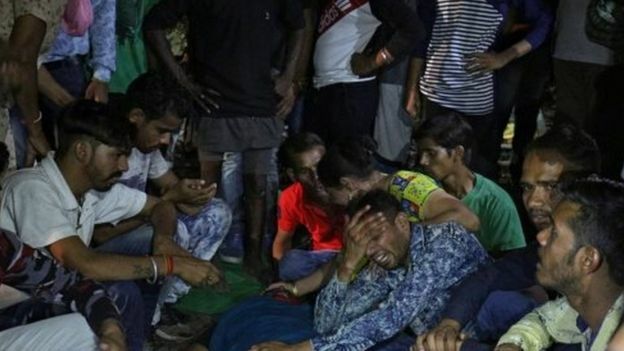 The victims were standing on the railway tracks watching celebrations for the Hindu festival of Dusshera, eyewitnesses told BBC Punjabi. They did not hear the train approach as they watched a firecracker-filled effigy of the demon king Ravana burn. Officials said the priority now was to take the injured to local hospitals. Footage posted to social media showed the fast-travelling train hitting the crowd. The incident happened at about 18:30 local time (13:00 GMT), said local journalist Ravinder Singh Robin. Just moments before, crowds watching the firecrackers show were asked by organizers to move back – towards the railway tracks, reports say. 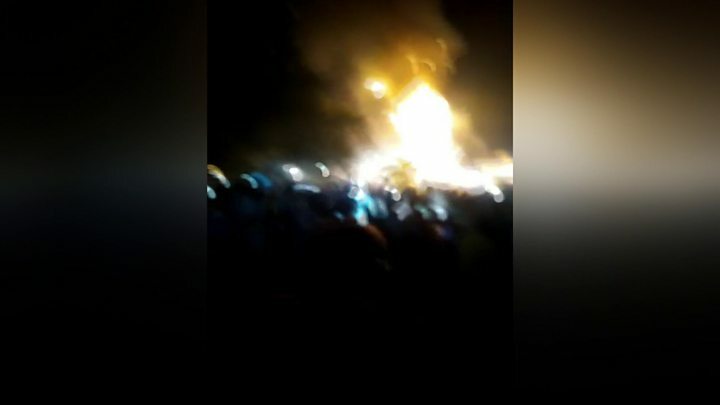 Punjab Chief Minister Amarinder Singh described the incident as “absolutely tragic”, and wrote in a tweet that local authorities were being “mobilized”. Prime Minister Narendra Modi described the incident as “heart-wrenching”. Train accidents are fairly common in India, where much of the railway equipment is out of date. The Chinese defence minister met Modi during which the PM said both the countries are handling their differences with “sensitivity and maturity” by not allowing them to become disputes. Defence minister Nirmala Sitharaman and her Chinese counterpart Wei Fenghe will hold extensive talks on Thursday, focus of which will be to remove distrust and boost coordination between the armies of the two neighbours guarding their disputed border, official sources said. Wei arrived in New Delhi on Tuesday on a four-day visit, nearly three-and-half months after Prime Minister Narendra Modi and Chinese President Xi Jinping agreed that strategic communication between the two armies should be enhanced to avoid Doklam-like standoffs. Sources said the primary objective of Wei’s visit is to deliberate with Indian defence establishment on implementation of decisions taken by Modi and Xi during the informal summit in Wuhan in April. In the delegation level talks, the Indian side is likely to raise the issue of presence of sizeable number of Chinese troops in North Doklam. Doklam, in the Sikkim sector, is a strategically important area which is claimed by Bhutan. India has been acting as security guarantor to the tiny country in the sensitive region. The two sides are likely to deliberate on a mechanism under which troops from both sides will inform each other before carrying out any patrolling on the disputed areas along the nearly 4,000-km border. The sources said both sides will also attempt to resolve differences in setting up of a hotline between the armies of the two countries. After the Wuhan summit, both sides revived the long-pending proposal to set up the hotline so as to avoid flare-ups along the disputed border. But, the initiative hit roadblocks over differences on issues relating to protocol and technical aspect of the hotline. The Indian Army has been maintaining that the hotline should be between its Director General of Military Operations (DGMOs) and his equivalent official in Peoples Liberation Army (PLA). However, Beijing proposed that the deputy commander of its Chengdu-based Western Theatre Command would engage with the Indian DGMO. Currently, India and Pakistan have a hotline between their DGMOs.The hotline between India and China was first mooted by the two countries in 2013. Government has taken a considered decision to rely solely on domestic efforts to tide over the situation, an official source said. The government is unlikely to accept any foreign financial assistance for flood-relief operations in Kerala, official sources said. The United Arab Emirates (UAE) has offered $100 million (around Rs 700 crore) as financial assistance for flood relief operation in Kerala. Sheikh Mohammed Bin Zayed Al Nahyan, the crown prince of Abu Dhabi, called up Prime Minister Modi and made the offer for assistance, Kerala chief minister Pinarayi Vijayan said in Thiruvananthapuram. Around three million Indians live and work in the UAE out of which 80% are from Kerala. The government of Maldives has also decided to donate $50,000 (Rs 35 lakh) for flood affected people in Kerala. It is understood that the UN is also offering some assistance for Kerala. However, sources said India is unlikely to accept the assistance. More than 324 people have died in the worst flooding in nearly a century in the south Indian state of Kerala. Officials repeatedly revised the death toll upwards from 86 people on Friday morning to more than 300 by the evening as a massive rescue operation reached more flood-hit regions. “Around 100 people died in the last 36 hours alone,” a state official said. Casualty numbers are expected to increase further, with thousands more people still stranded and less intense though still heavy rain forecast for at least the next 24 hours. Many have died from being buried in hundreds of landslides set off by the flooding. The Kerala chief minister, Pinarayi Vijayan, said the state was experiencing an “extremely grave” crisis, with the highest flood warning in place in 12 of its 14 regions. The Indian prime minister, Narendra Modi, was on his way to Kerala on Friday evening “to take stock of the flood situation in the state”, he said. Kerala, famed for its tea plantations, beaches and tranquil backwaters, is frequently saturated during the annual monsoon. But this year’s deluge has swamped at least 20,000 homes and forced people into more than 1,500 relief camps. India and Seychelles said on Monday they would work together on developing a naval base on Assumption Island while keeping “each other’s interests” in mind, days after reports suggested the Indian Ocean archipelago had scrapped an agreement on the project. Following talks in Delhi, Prime Minister Narendra Modi and Seychelles President Danny Faure said both sides will continue working on the Assumption Island project. Modi announced a $100-million line of credit that Seychelles can use to acquire Indian defence equipment to boost its maritime capacity. He also said India will provide a second Dornier aircraft for the Seychelles military. The remarks by both leaders assume significance as Faure had said earlier this month his government had scrapped an agreement with India for setting up a naval base on Assumption. He had also said the project “will not move forward” and the issue wouldn’t be discussed with Modi during his visit. Two days before the president began his visit, secretary of state for foreign affairs Barry Faure, who is Faure’s brother, told Reuters the government wouldn’t present the agreement on Assumption Island to the National Assembly for “approval because opposition members (who are the majority) have already said they will not ratify it”. During a joint media interaction with Faure, Modi said: “In the context of the Assumption Island project, we are agreed on working together in each other’s interests.” He did not give details. The first agreement on the project was signed during Modi’s visit to Seychelles in March 2015. Following public protests in Seychelles, the two sides signed a revised agreement in January to build military facilities on the remote island. Under the revised pact valid for 20 years, India was to build an airstrip and a jetty for its navy on Assumption. Faure is expected to face an uphill task in getting the project ratified by Parliament that is dominated by the opposition, which has been opposing any Indian military presence on Assumption. India has been working overtime to bolster its naval presence in regional waters to counter China, which last year inaugurated its first overseas military base in Djibouti, near one of the world’s busiest shipping lanes. Defence and security issues were a key part of the discussions between the two leaders and Modi said both countries have a “geo-strategic vision for peace, security and stability in the Indian Ocean” and have to contend with various traditional and non-traditional threats. While working together to derive benefits from a “blue economy”, Modi said the two sides will also have to jointly confront challenges such as piracy, drugs, human trafficking and trans-national crimes. He added that India will help Seychelles to build a new police headquarters, a new office for the attorney general and a new government house, and that Indian experts will be sent on deputation to the archipelago. Faure described India as “one of our closest and reliable partners” and said Seychelles will benefit from the line of credit to aid the military and defence forces. He said he and Modi had “expressed our strong desire to elevate our bilateral relations to a more comprehensive partnership of a greater strategic importance”. The two sides signed six agreements on issues such as infrastructure development in Seychelles, cyber-security, sharing of white shipping information that will enable them to exchange data on the identity and movement of non-military commercial vessels.